Does anyone have the answer to John's question? I'm in the same boat where I have bought a set of Koni sport adjustable shocks for a "914" but I don't know if the same insert fits the 911 Boge or Koni struts. I could check to see if my shock boxes have any part numbers left and compair that to the 911 numbers. Also as far as brake caliper mountings go, does anyone have a thread that references caliper mounting hole spacings? Also curious to see spacings for calipers that don't use the "ear" style, like on the late model front end Brembo calipers. I believe from the 993 on (in the 911 circles) they switched to the bolt through the top of the caliper mount, but haven't crawled under too many 911 cars. I know 928's switched in 87 when the S4 came out but 944's never adopted this style. 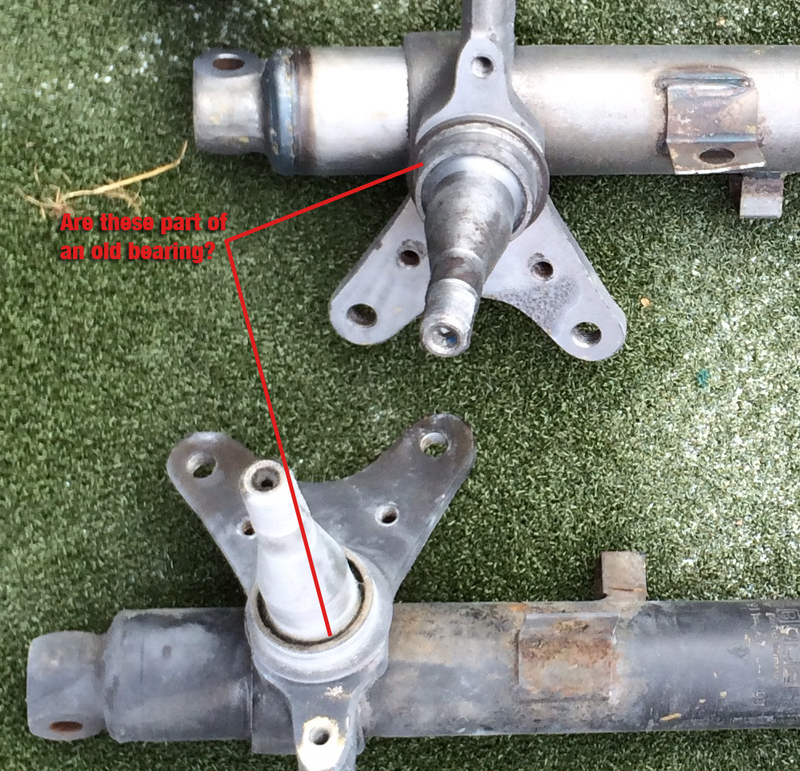 I want to thank the op for this post, helped me solve my axle problems on my kit car. 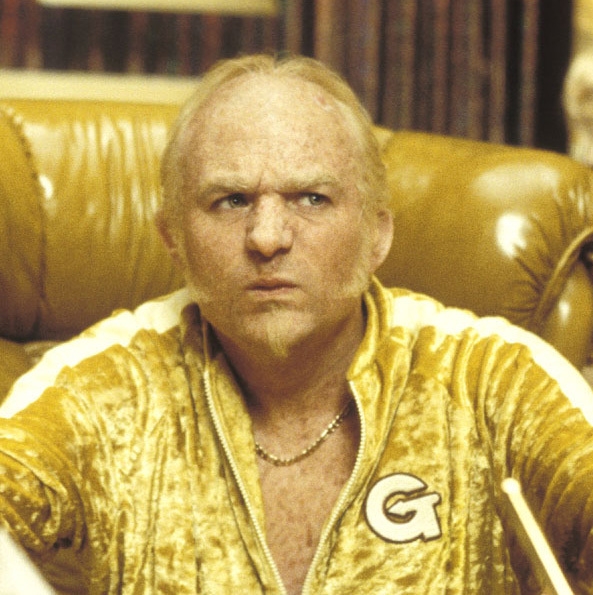 This thread before Goldmember pic: Awesome. I have a front end out of a '84 carrera. Back end is stock 914 with 5 lug rotors. I also have a 19mm mc. I am not happy with the performance. I really have to put out a lot of leg pressure to get the car to stop like the way I think it should. I have firm pedal feel but I have to really push down much harder then I thought I would. I thought by going this route I would have something similar to power brakes. I figured I would have fantastic brakes that wouldn't need so much pressure to get them to stop. Just want to know what I should expect? By the way 3.2 powered. Believe it or not, this is a common syndrome. The cars with the A-Calipers (911SC and 911 Carrera) have a brake booster (power brakes) so there's one issue. You may be like most people driving a modern car most of the time which also has power brakes. That's another issue. Modern pads tout "no squeal" performance. No squeal yes. Performance no. That may also be an issue. You now have 24mm rotors performing the task of "rotating mass" on a 2,300lb car. These rotors have zero advantage on our cars and only a negative return of added, unsprung weight. The SC version carries the same caliper (so, same pistons, same pads, same everything...just smaller spacers) but it sits on a 20mm rotor. That rotor is lighter and easier to slow down on a light weight car. You are now front bias heavy with the 48mm pistons up front and the 33mm pistons in the rear. That can be an issue. 1. Unboosted brake systems from the 70's don't feel like modern day car brakes so... the brakes in someones Chevy Cruze may "feel" better to the average driver than those on a 914-6/GT equipped with 908 calipers and GT rears. (you have a lot of Porsches and a handful of vintage examples so, I doubt this is your issue... it is for a lot of people expecting that easy pedal and screeching halt stops though). 2. Pads can make a big difference. BEDDING your current pads can help as well. If everyone went and bedded their pads this weekend (yes, even old ones) following the bedding procedure on our site, they would come back reporting better brakes on Monday. That "may" be it. 3. 24mm rotors and Carrera calipers offer a ton of weight to a 914 braking system. Weight that is simply not needed. Weight in "rotating mass". Think you need them? Go watch Frank Beck in his 914 in HSR Series racing. Report back. He's one of the fastest guys I've seen in a 914. They are all using S-Calipers and 20mm rotors. If you have to run the A-Calipers (the heaviest caliper ever put on a 911) then I would default to the SC variety which uses the 20mm rotor. Finally, make sure your rears are even in the hunt. I've said it before and I'll say it again here. "Most of the rear calipers on the cars on this site are probably not even working." Again, Buck, this isn't a crack toward you or anyone else for that matter. It looks like you have a wide variety of vehicles and I'm hoping they get maintained appropriately. Let's just make sure the venting clearance has been set and the rears are even doing their job. That should bring a 30% improvement for a lot of 914's out there. If the same guys who are going to bed their pads, set their venting clearance first, we should see a dramatic improvement. And don't forget that the 19mm MC will require more force on the pedal than the stock 17mm MC. Personally, i like this but you do have to really jump on the brakes hard to get them to grab aggressively. What bearings are needed for 3.5" front struts? I know there's a front and back, but what about the washers and gaskets? I have a set of Boge struts and it looks like there's a bearing chase stuck on there, but I can't be sure. I want to replace all the bearings, but also want to make sure I buy the right ones. 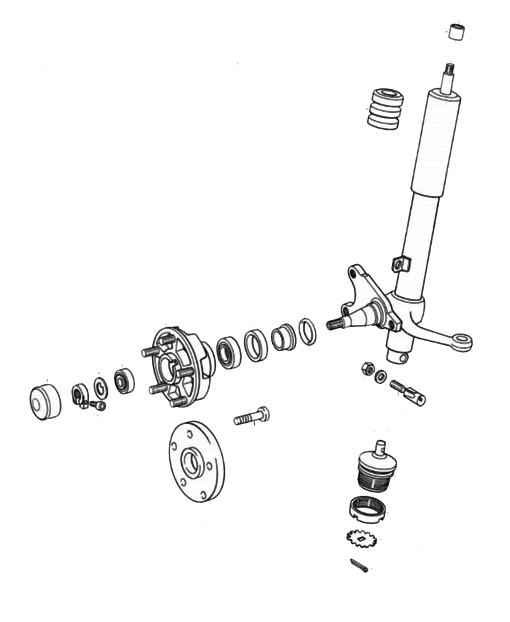 When I look at the parts diagram, there seem to be a number of different pieces needed. On a 911 the ring needs to stay, the dust seal goes inside the hub and seals up to the ring. The inner wheel bearing sits inside the hub and slides on to the stub axle. There is a very thin plastic washer under the collar as well that confuses people when looking at the diagram. Any chance the stub lock nut is the same on the 3.5" struts as the 3"? I have 3" now and will be upgrading them shortly, and I already have fresh bearings. Just trying to figure out what I need to buy. They have changed over the years. They could be the same, try them. The spindle nut on a 914/4 is threaded different than its 911/914/6 counterpart. The 16mm spindle nuts are NLA, for 911 struts to '73. The available 18mm spindle nuts fit later '74 to '89 911 struts. Yup. 914 spindles are smaller all around. Smaller inner and outer bearings etc. 911 had the 16mm early and the 18mm later. Now re-reading Doug's post, it sounds like he meant stock 914, to which Clay is correct. Sorry, I thought you were talking about the 3" and 3.5" 911 spindles. FYI... a few years ago I did some digging with a local bearing seller. We found two tapered roller bearings with the proper OD for a 911 hub, and the proper ID for a 914/4 spindle. We also found the proper seal. I was going to buy a couple dozen sets and offer them for sale on world for easy 5 lug conversions. Just bolt on the rotor and an 3" M caliper. No, you were right Eric. I have 911 "A" struts and M calipers on there now. I'm going home now to wrench for the rest of the day and I'll see what I've got. Either way, I can order new spindle nuts and make sure that I have the right thing. As soon as I get the car stripped and off to the sandblaster, I'll start working on the suspension in earnest. I've got time to see what I need to order to make sure it's done right. On the subject of front wheel bearings, can someone confirm that these are the WRONG bearings for 911SC struts? The came with the car. I have no clue what they go to. I have 911 "A" struts and M calipers on there now. I was able to get "The Google" working on my computer. 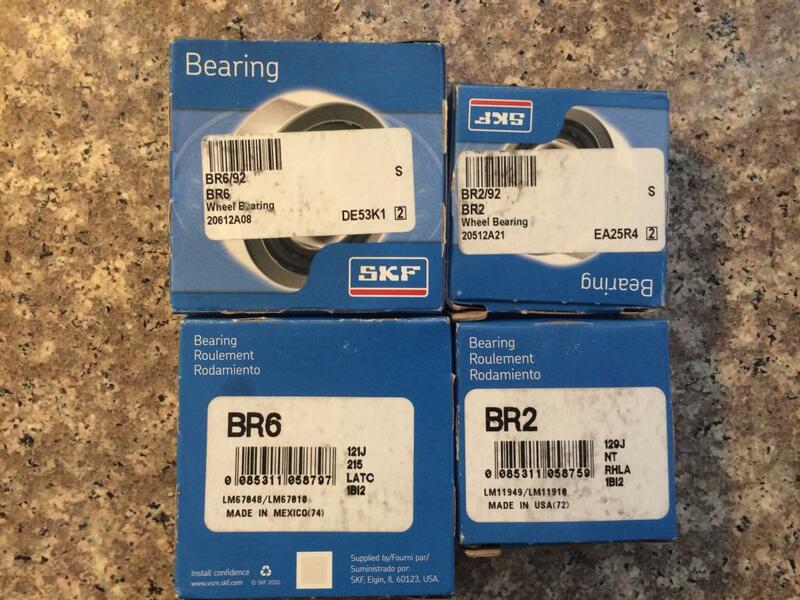 Those are the correct inner (larger) and outer (smaller) bearings.